TMR: How and why did you choose the profession of fashion designer? DUY: Since I was young, I always wanted to be a fashion designer or an architect. Since I found out that architecture requires absolute rigour, I felt that I wasn't good enough. 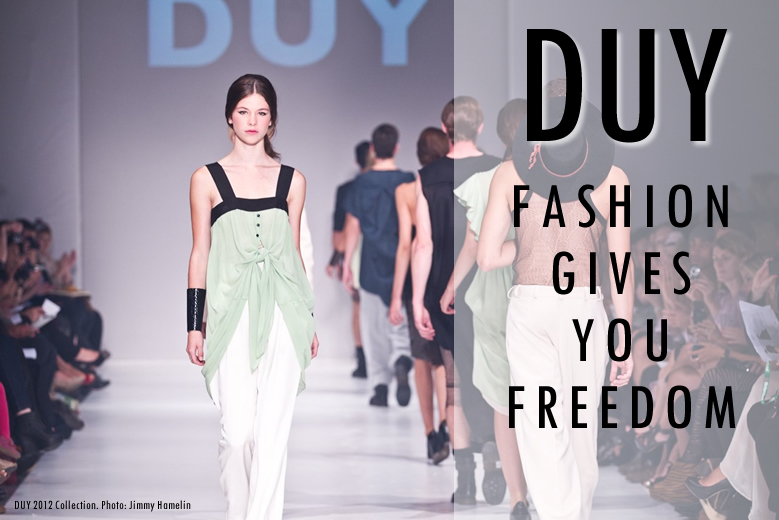 Fashion gives you more freedom. TMR: You created your own very successful collection. What were the challenges you faced while building your brand? DUY: Finance. We are a village and most of people think that a designer dress cost 50$ in Quebec. TMR: What do you think is fashion? DUY: It depends for who. Some people make clothes for everyday and for some other to dream. I prefer dreaming. TMR: What inspires you in your work? DUY: Everything, from art to nature. TMR: Can you imagine the fashion trends five or ten years in advance? Or next season is always absolutely unpredictable? DUY: Actually you can sort of guess a little in advance. If you see too much of details one season, the next ones will be more minimal. Too much color one season, the next one will be more subtle. I don't follow trends so I don't really care. Trends are for people without self-confidence. TMR: Do you think that the way we dress is the way we think and feel? DUY: Most of the time - yes. But sometimes it's influenced by your body type and budget. "Last season, I played around with my collection by introducing menswear," says DUY. "This time around, I pushed my boundaries by stepping outside my Femme Fatale comfort zone."